Synopsis: The Boy Who Lived In Pudding Lane - -Being a true account, if only you believe it, of the life and ways of Santa, oldest son of Mr. and Mrs. Claus- first appeared in the American magazine, Ladies Home Journal, for Christmas in 1921 and was published as a hardcover the following year. Author Sarah Addington's charming story of the boyhood life of dear Santa Claus became an instant classic and is lovingly reproduced in a facsimile edition for the first time here, including the original size, page format, and layout. The original illustrations reproduced for this edition are magnificent and were originally created by prominent American illustrator Gertrude Kay, whose iconic style with Ladies Home Journal started a career in children's illustrations that included her famous Alice in Wonderland edition in 1923, among her other works. 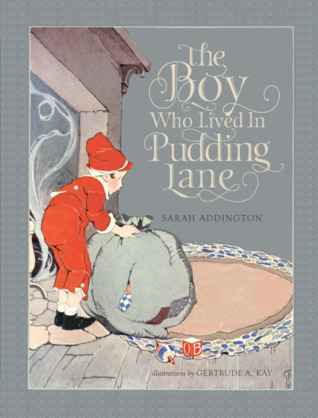 The story follows Santa as he grows up in Pudding Lane, eventually to become the famed gift-giver who flies around the world - and would spawn a line of books about the Lane and it cast of characters released by Addington and Kay throughout the 1920s. A perfect gift book to read each year to children of all ages, The Boy Who Lived in Pudding Lane is now back in print in a stunning edition that will be a treasured heirloom for families to share. Review: A delightful combination of nursery rhymes and fantasy tells the origins of Santa Claus. Children and adults will love this delightful story with its beautiful illustrations. A very fun read. About the Author: Sarah Addington (1891–1940) went to Earlham College where she received a A.B. degree in 1912. Sarah, writing under her maiden name, Sarah Addington, wrote a series of children's books which became popular. Following her graduation from Earlham she attended Columbia University where she graduated as the only women member of the first class of the Pulitzer School of Journalism. In 1915, she became a special writer for the Sunday magazine section of the New York Tribune and later was assistant publicity director of the National American Women Suffrage Association. In 1917, when New York State granted the vote to women, she resigned to marry. Miss Addington continued her newspaper career under her maiden name after her marriage, serving in the city staff of the Tribune, and later entering the publicity field. From 1921 to 1923 she was on the staff of The Ladies Home Journal.